Address given by Ken Carter at the Yeovil Crematorium on September 3rd 1999. A transcript of the scanned pages are provided to the left for accessibility sake. People in West Bradley and its surrounds would not be aware of and know his worldwide connections. He wrote to all and sundry – presidents, monarchs, politicians, musicians, philosophers, clerics, writers and film stars and got many positive replies. You name a person and the chances are that he has sent them a letter or one of his ‘word filled’ cards. I would like to mention the names of three. 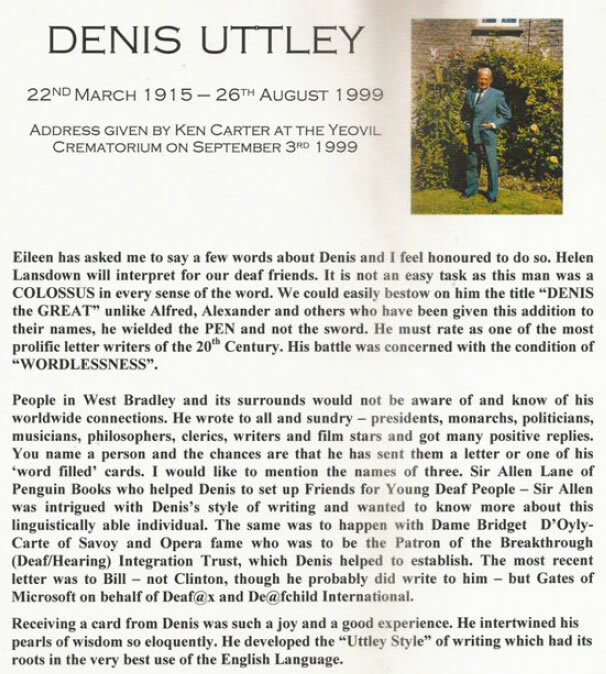 Sir Allen Lane of Penguin Books who helped to set up Friends for Young Deaf People – Sir Allen was intrigued with Denis’ style of writing and wanted to know more about this linguistically able individual. The same was to happen with Dame Bridget D’Oyly-Carte of Savoy and Opera fame who was to be the Patron of the Breakthrough (Deaf/Hearing) Integration Trust, which helped Denis to establish. The most recent letter was to Bill – not Clinton, though he probably did write to him – but Gates of Microsoft on behalf of Deaf@x and De@fchild International. Receiving a card from Denis was such a joy and a good experience. He intertwined his pearls of wisdom so eloquently. He developed the “Uttley Style” of writing which had its roots in the very best use of the English Language. I have tried to write a number of words on a postcard using Denis’ technique to convey something of his life. Each word has a story which I haven’t time to tell you today. There will be other opportunities in London to commemorate his life, and his interaction and friendship with other deaf and hearing people. So, let me read these words to you. I know Denis is listening and watching and he may even add a few more for us! Phew! Wasn’t that a challenging list of WORDS? I think he truly meant that. 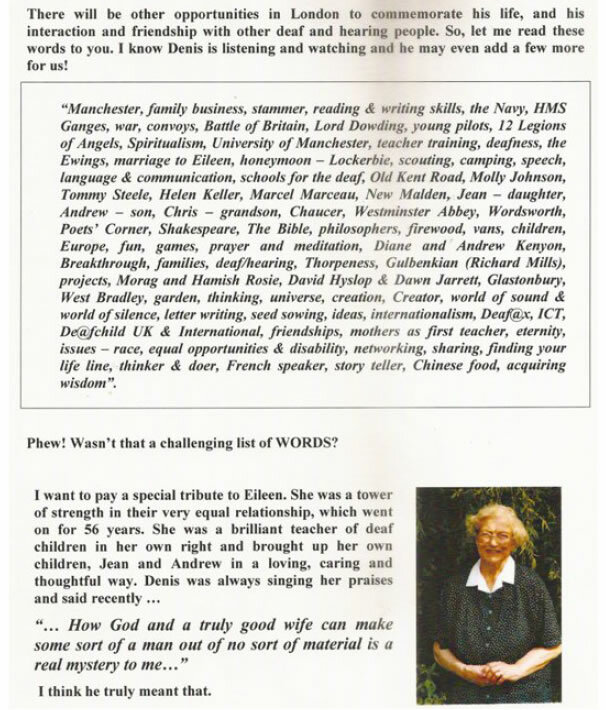 With regard to Jean and Andrew, he was quietly proud of their many achievements: Andrew going to Cambridge with Engineering and musical talents, and Jean reading Music at Exeter University and later becoming an outstanding Music teacher. denis often mentioned Chris with great affection and love. 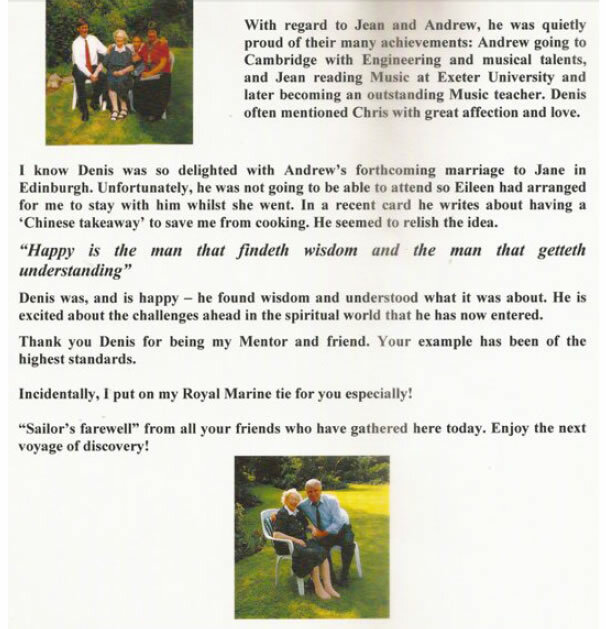 I know Denis was so delighted with Andrew’s forthcoming marriage to Jane in Edinburgh. Unfortunately, he was not going to be able to attend to Eileen had arranged for me to stay with him whilst she went. In a recent card he writes about having a ‘Chinese takeaway’ to save me from cooking. He seemed to relish the idea. Denis was, and is happy – he found wisdom and understood what it was about. He is excited about the challenges ahead in the spiritual world that he has now entered. Thank you, Denis, for being my Mentor and friend. Your example has been of the highest standards. Incidentally, I put on my Royal Marine tie for you especially! “Sailor’s farewell” from all your friends who have gathered here today. Enjoy the next voyage of discovery!